The last few days have been a trial...for humans and the animals who love them, in the city of Orlando, in Florida. There was a terrible act of violence perpetrated, at the nightclub called Pulse, early Sunday morning; 49 humans killed, possibly more, and 53 wounded. Good evening felinity assembled, Sneakers the Texian Tuxedo here and I will not be linking to a story about this act of Islamic terrorism committed by one evil human...you can look them up yourself, if you haven't already. I want to share 2 stories that will not get the coverage they deserve in the aftermath of this tragedy. I hope you will find them worth telling and share this post around. Good afternoon, felinity assembled, Sneakers the Texian Tuxedo here with some important news. We cats like to lay in the window, part of the day, to watch the passing scene, from humans, to birds, to squirrels, to dogs walking their humans, and stray cats. Sometimes things can get embarrassing like when the neighbors ooh and ahh at us, sometimes things can get downright weird like when a local stray cat comes by, sees one of us in the window and leaps up on the outside fan box to yell at us and claw holes in the window screen, and then there is what happened this morning. This morning something unexpected happened and I napped right through it! Good evening felinity assembled...Sneakers the Texian Tuxedo, here, with quite the story to share, videos and photos included. Yes, I know today is Thursday...my story began on Tuesday night, though, so bear with me. We 3 cats spend a lot of time, day and night, sitting in the window of our apartment watching the passing scene of animals and humans...except when we don't and take naps in other spots, play, watch daddy on the computer, or work on our own blog posts. Tuesday evening we were napping. Just before 11pm there was a knock on the door...a neighbor alerted Daddy Kiril to something on our doorstep. Imagine his surprise, and ours, at what he found. Actually, it should not have surprised us. What is surprising is that something like this had yet to happen in the almost 4 yrs. daddy has lived in Houston. Elvira was a doorstep rescue when they lived in Santa Ana, Ca., but the circumstances were quite different. 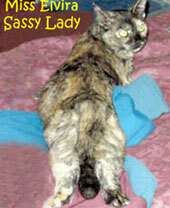 and so we had an abandoned feline on our paws. There was a half asleep, confused and scared cat in the carrier, a half full Science Diet Hairball dry food bag and 4 cans of Science Diet wet food, as well as a red pet bed. More on that below the fold. The neighbor took some photos for daddy as he investigated the bag, read the letter and took his first look at the cat. Today marks the 180th anniversary of the start of the siege of the Alamo....13 days of glory that played a role in the eventual independence of Texas from Mexico. I am Sneakers the Texian Tuxedo, 9th and possibly last in a line that traces its history back to the defenders of this mission in San Antonio, Texas. Sneakers the Texian Tuxedo here to welcome you to my world for round 4 of Texas Tuesday. Miss the preview and first edition? Not to mention round 2 and 3? Have a look and return at your convenience, hee, hee! Yesterday Elvira Mistress of Felinity updated our "More Praise" for the pussycats page big time! Today I want to share a contrary opinion and Texans will be particularly interested in this one, trust me. Listening to a popular conservative talker, on the radio, last night, while waiting for Daddy Kiril to come home from work I heard him share and discuss a speech given by Madeleine Gloria-Ann Richards along the banks of Woman Hollering Creek, outside San Antonio, TX., on February 6, 2016. Now, before I tell you what she said, a little background for those who have no clue who she is. Sneakers the Texian Tuxedo here to welcome you to my world for round 3 of Texas Tuesday. Miss the preview and first edition? Not to mention round 2? I had big plans for this series (Yes, sadly, #2 was in February), but a lot has happened this year and we here at Opinionated Pussycat are hoping to finally get back on track. 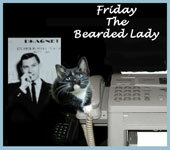 This post is about little Friday The Bearded Lady, our little Tuxie newbie, and her effort to impress and cheer up Daddy Kiril as he worries about putting food in his pantry and kibble on our table and keeping us in litter (not to mention finally pay for Elvira's renewal of her, required, city license) until his 1st November paycheck. It is I, Sneakers the Texian Tuxedo, 9th in a long line going back to the Alamo (my predecessor met his fate on a street in Laredo). Things have been crazy among the humans across America, in Texas and especially in Houston, the last few weeks. Recently a human sheriff's deputy was brutally assassinated here in Houston, just one of several cops to be killed in the line of duty, or in their home, by cowards and criminals in recent weeks. The humans have responded in the best way possible with a memorial, vigil/walk, and financial support for the family. Outrage has been expressed in print, on blogs, on TV, radio and social media of all types. Sneakers the Texian Tuxedo here to welcome you to my world for round 2 of Texas Tuesday. Miss the preview and first edition? Anyway, I had big plans for this post, after reading a remarkable article, in a local weekly, that sheds a lot of interesting light on and asks important questions about, a program Elvira first wrote about last year. That will have to wait, though, as Elvira and I suddenly find ourselves playing nurse kitties to Daddy Kiril as he fights a cold and cough, at work and here at home this week. As he says... it's not the way he had hoped to spend the time before his 55th birthday, or the day itself (a day off), March 5th (apparently a big milestone birthday to reach for humans) . The response to the preview and first post, while small, was huge in its encouragement and support in the comments, and on Facebook. I thank everyone for that. As I mentioned last week I want to not just reach out to rescues, shelters, and human political leaders across the state, but to my fellow Texas cat bloggers and their humans, too. Rescues, Shelters, Societies, Foundations and Associations is a page with a growing selection of Houston, Harris County and Texas links. 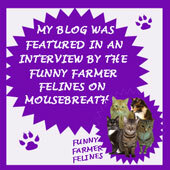 Texas Animal Bloggers (TAB) is a page devoted to identifying and listing links to Texas animal and pet bloggers. Well, that's it for this week, I'm off to check on daddy to make sure he drinks his Thera Flu! Well, gutter my buff and call me a biscuit! I'm Sneakers the Texian Tuxedo. If you were here last week you know this is the first official Texas Tuesday, know a bit of the history of my lineage and what I hope to do with the weekly series. Welcome to my world! B.Y.O.C. (Bring Your Own Catnip)! The Republic of Texas, the land where everything goes better with picante sauce...including wet and dry cat kibble...or so I keep hearing; I'm only a year and a half old and, while native born, I live with a human who isn't native to the state and hasn't considered testing this bit of advice out on the kibble he feeds my mentor, Elvira Mistress of Felinity and I...yet. Texas is an interesting place...and HUGE, too! 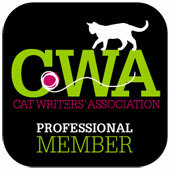 I want to not just reach out to rescues, shelters, and human political leaders across the state, but to my fellow cat bloggers and their humans, too. All three of us have a lot to learn about Texas and the place cats have and have historically have had, in it. The Texian Tuxedo's Texas Tuesday! Good evening felinity assembled and howdy, Texas! I had considered all T's in the title of this new weekly notion of mine but, alas, it didn't appeal to me as much as what I decided on using. Oh, and yes, I KNOW today is Thursday...just go with me, here, OK, hee, hee! 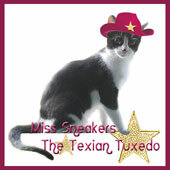 I am Sneakers the Texian Tuxedo! "Over the past 160 years there has always been what became known as the Texian Tuxedo, born in a year soon after the previous one went to Rainbow Bridge. This feline, always male, seemed to live during times when interesting, even important, events in Texas history occurred, even possibly playing a role in such events. These cats, all male, were all independent, curious, strong-willed and opinionated; storytellers, poets and passers on of news from the human and feline worlds wherever they went. None made their homes among humans, at least not permanently, always finding some reason to move on. The last one died in early 1998. 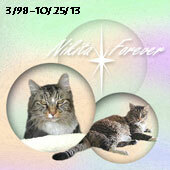 A lot has happened in this state, since, yet no successor was born, leaving felinity assembled in TX to wonder…." And that, dear reader, brings us to me.